Flying on commercial airlines is usually very safe for people with cancer who are stable, reasonably healed from any surgeries, and do not have a very low white blood cell count or platelet level due to chemotherapy. That said, it's important for anyone with cancer to talk to their oncologist before scheduling any air travel to discuss potential concerns about oxygen levels or pressure changes during flight, or the need for preventive measures against blood clots. Here we will look at these concerns, common questions people have about medications or medical devices while flying, and general measures that can help you prepare for seamless travel. Flying with cancer can sometimes have significant benefits. In some cases, people may need to fly to the cancer center where they will be treated. But pleasure trips are encouraged by many oncologists as a great way to cope with the rigors of treatment and to reconnect with family and/or friends outside of the clinic or hospital setting. Many people wonder about the best time to travel during treatment, and the answer will be different for everyone. Air travel should be avoided if at all possible for at least two weeks after surgery for a number of reasons (and much longer is some situations such as after brain surgery). In general, any incisions should be well healed and any drains removed. With chemotherapy, the best time to fly will depend on the particular chemotherapy regimen you are on, as well as other factors such as side effects you are experiencing and more. With some protocols, the chemotherapy nadir (when blood counts are at their lowest) occurs around 10 days to 14 days after an infusion, and your oncologist may recommend travel either earlier or later for this reason. A low white blood cell count can increase infection risk, a low red blood cell count (anemia) can make you more tired, and a low platelet count (thrombocytopenia) can increase the risk of bleeding. With high dose chemotherapy, such as with some leukemias, air travel may be discouraged throughout the duration of treatment. The Air Travel Access Act of 1986 prohibits discrimination on domestic flights in the United States on the basis of disability. Despite a few "horror stories" that spread through the news regarding transportation security administration (TSA) agents and "pat downs," TSA agents are ready to assist those with disabilities due to cancer with courtesy and respect. TSA recommends calling their helpline 72 hours before travel to discuss the screening process. You may call TSA Cares at 1-855-787-2227 for information on what to expect at the security checkpoint. You may also request a passenger support specialist. These TSA specialists are trained in assisting people with disabilities of all kinds. Many people with cancer will need to travel with medications or medical devices. In addition to making sure that you have an adequate supply of medications (with at least a few extra days worth in case of delays or changes due to weather), there are several other things you should consider. Carry all medications on board in a carry-on rather than checking them with your luggage. This includes any medications you use for side effects such as anti-nausea drugs or pain medications. Keep all medications in their original containers. Though it's recommended that you bring enough medications for your entire trip plus unexpected delays, many insurance companies have a limit on the number of pills you will be prescribed at one time. If this is an issue, talk with your pharmacist. Medications that cannot go through the X-ray machine are allowed, but you will need to talk to the TSA agent and may require a pat down. If you have medications in liquid form, containers containing more than 3 ounces are allowed but you will need to remove the medication from your bag and mention it to the TSA agent before going through security. Medications and Travel Outside the U.S.
Keep in mind that drug approval varies among countries and that your particular medication may not be available where you are traveling. It's also very important to make sure that your medication is legal in the countries you are visiting. For example, drugs containing pseudoephedrine (such as Sudafed) are illegal in Japan. Amphetamines such as Adderall are illegal in Japan and Saudi Arabia. Narcotics may be illegal or restricted, for example, codeine is illegal in Greece and Hong Kong. Some countries (such as Costa Rica) require that you have a doctors note describing the medications and only bring enough for your stay. When traveling overseas, make sure to check out the laws, as exceptions are not made, even for people with cancer. If needed for a medical condition, you may carry syringes and injectable medications on board the plane. It’s advisable to carry a doctor's letter indicating the necessity of carrying these medications since some checkpoints may require a physician's recommendation (on letterhead stationary). Though marijuana is now legal in many states, it is still illegal under TSA law (and federal law) even with a doctor's note, and could be risky. This is true for CBD oil as well. While the TSA does not search for marijuana, if detected they defer to local law enforcement. People with cancer should not travel with medical marijuana outside of the United States. If you have a port, ostomy, or other medical device, you will need to tell the TSA agent before going through screening. In some cases a pat down may be required. Most of the time you will be allowed to wear a wig, scarf, or other head covering as you go through security as these are considered medical items, but may be subject to a pat down. You can request a private screening if you would like. Breast prostheses do not need to be removed, though you will need to tell the TSA agent before screening and rarely a pat down will be required. Most airports provide transportation services beyond the security checkpoint. Check with the airports you will be visiting to see what services are available. Airlines usually announce advance seating for people with special needs along with first class passengers. If you need assistance with boarding, this option may be helpful. That said, if you are able to move around it may be a good idea to instead move around and board towards the end of boarding, especially if you have a long flight. Prolonged sitting raises the risk of developing blood clots. Exercise your legs while sitting. On overseas flights, it's now common for passengers to be shown a video on leg exercises which may reduce the risk of clots when performed in flight. You can exercise your legs by tightening and then releasing your calf muscles or turning your foot in a circle. You can also exercise your legs by lifting your heel repeatedly with your toes on the floor, then lifting your toes several times with your heels on the floor. Avoid drinking alcohol as it can lead to dehydration and makes platelets (the factors in the blood that cause clotting) stickier. Talk to your doctor about other measures if you are at a high risk of developing blood clots. She may recommend taking aspirin or a one-time injection of low molecular weight heparin. If you've had blood clots in the past, it's crucial to talk to your doctor about whether you should fly, and if so, what other measures you should take. Flying results in a statistically significant decrease in oxygen saturation in the blood. Even though cabins are pressurized on commercial flights, oxygen levels are similar to being at an elevation of 5,000 to 8,000 feet. Oxygen levels may be lower than this on small planes. For those who are healthy, the body accommodates to this lower oxygen saturation quite well. But for those who have compromised lung function due to respiratory ailments, COPD, lung cancer, or lung metastases from other cancers, this can pose a problem. If you suffer from a respiratory condition you may require supplemental oxygen for flying even if you do not require oxygen on the ground. Talk to your doctor before flying. She may be able to make recommendations or offer tests to determine if you will require oxygen in flight. While commercial airliners carry oxygen, this is reserved for emergencies. For people who have COPD and cancer, or who aren't certain whether oxygen may be required, your doctor may be able to make a prediction based on specific tests. Researchers have developed a pre-flight algorithm that can be used to predict whether or not you may need in-flight oxygen. Since it's been found that people with respiratory disease tend to underestimate their potential need for oxygen when flying, this is a helpful approach for making the decision more objective. Some airlines—but not all—allow portable oxygen to be carried on board the aircraft. According to TSA, if you are able to disconnect from oxygen it's recommended that you check your oxygen as checked baggage. While checking your oxygen is the ideal method of transport, if you require oxygen when on the ground it's likely that you will require oxygen to an even a greater degree while flying. If you plan on using portable oxygen in flight it's important to call the airline ahead of time to understand any restrictions. It's also necessary to check with the manufacturer of your oxygen concentrator to see if it is approved for flying. Delta airlines does allow approved portable oxygen containers with advance notification (but not devices that contain liquid oxygen). A POC approval form must be received by the airline at least 48 hours prior to flying, and if approved will need to be carried with you when you fly. Several other restrictions also apply. The FAA requires that the battery time is 150 percent of your cumulative flight times. If you need to rent oxygen, OxygenToGo personnel can help you with this process, but you will need to plan well ahead of your flight. As airlines differ in their regulations, it is important to check with your airline before flying, leave plenty of time to purchase or rent an approved oxygen device if needed, and to receive a doctor’s statement that you require in-flight oxygen. Just as scuba divers may experience problems due to air pressure under water, changes in air pressure as a result of the increased elevation in flight can potentially cause problems for some people. It's estimated that gasses in body cavities can expand up to 30 percent with flying on a commercial airline. For this reason, physicians recommend not flying for a period of time after certain procedures. For example, it's advisable not to fly for 10 days after a colonoscopy, for two weeks to four weeks after chest surgery, and up to six weeks after brain surgery. After surgery in general, a wait time—usually around 2 weeks—is recommended as the pressure created by changes in altitude could result in incisions breaking open. Talk with your doctor if you have a brain tumor or brain metastases as air travel could create brain swelling. Most people with brain tumors can travel by air safely, though symptoms may worsen. In some cases, oncologists may recommend steroids or anti-seizure drugs prior to flying. Changes in air pressure can also cause swelling in the hands and feet. People with lymphedema, such as after breast cancer surgery, should talk to their doctors before flying as to recommendations. Overall, wearing loose-fitting clothing and staying well hydrated is important in minimizing discomfort at an increased altitude. 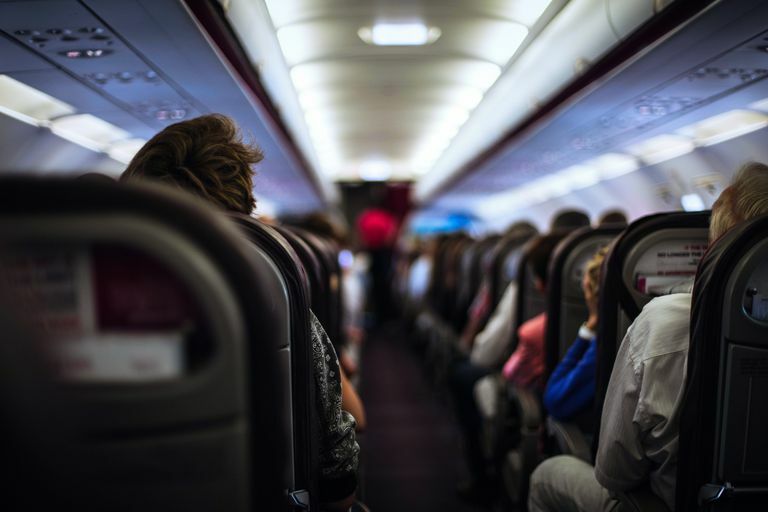 Air travel significantly increases the risk of contracting a respiratory infection ranging from the flu, to SARS, to dengue fever aboard aircraft has been noted. A 2018 study quantified this risk to a degree, at least for infections spread by respiratory droplets that are propelled short distances. The relative risk of contracting an infection is roughly 80 percent for people seated within one row (a row in front or row behind) or within two seats on each side of a passenger who is ill with a cold or flu virus. This risk drops to less than three percent for those further away. The risk can also vary depending on movement up or down the aisle, with the greatest risk conferred by ill flight attendants. Fortunately, the absolute risk is much lower (about one passenger infected for each ill passenger that boards the plane) and there are some things you can do to avoid exposure. Carrying hand sanitizer is one (of course, less than three ounces) that can be used to wipe down the tray table, seatbelt buckle, and bathroom doors. If you note someone coughing or sneezing, you could also let the flight attendant know that you are a cancer passenger and have him or her ask if anyone is willing to trade seats with you. Wearing a mask is also an option. If your white blood cell count is low due to chemotherapy or your cancer itself, talk to your doctor about whether or not you should wear a mask. Also, ask her for recommendations about the right mask since some may offer more protection against germs than others. Chemotherapy-induced neutropenia a low level of the type of white blood cells called neutrophils that fight infections) can be a challenge when traveling in many ways. There are many "hidden" risks of infection when you leave home, and it's helpful to learn about ways to prevent infections if possible whether traveling by air or not. Vaccinations may be required for travel to certain regions of the world. Live vaccines, such as the MMR, yellow fever vaccine, and oral typhoid can be dangerous for those who are immunocompromised. In contrast, some immunizations may be recommended, such as the injectable flu vaccine. It's important to note that even if immunizations are considered okay, they may be less effective or ineffective for people undergoing treatment for cancer. If you list out your planned activities in this way you will be more likely to participate in the activities you most wish to do, and will hopefully feel less guilty when you need to take a day or two and just rest. Many airlines, as well as companies such as Expedia and Travelocity, offer travel insurance when you purchase your airline tickets. This is often a small price to pay relative to the cost of your ticket, but the coverage can vary. Some cover only the cost of your ticket, and documentation by a physician of a medical reason for the change or cancellation may be required. Others offer services in addition to reimbursing your ticket cost, such as emergency medical care at your destination. Make sure to read the fine print. Once you've thought through the physical issues related to flying, you may have concerns about the financial issues. If you are traveling by air for treatment, you may be able to get some assistance. Several organizations provide free air travel for those with cancer who need to travel for medical treatment. Remember that flying is only one part of your journey. Take the time to think through lodging, transportation, and other issues ahead of time so you are prepared to enjoy your time away. Josephs, L. et al. Managing Patients with Stable Respiratory Disease Planning Air Travel: A Primary Care Summary of the British Thoracic Society Recommendations. Primary Care Respiratory Journal. 2013. 22(2):234-8. Thibeault, C., and A. Evans. AsMA Medical Guidelines for Air Travel: Airline Special Services. Aerospace Medicine and Human Performance. 2015. 86(7):657-8. Transportation Security Administration (TSA). TSA Travel Tips. Traveling with Medications. Edvardsen, A., Akero, A., Christensen, C., Ryg, M., and O. Kjonsberg. Air Travel and Chronic Obstructive Pulmonary Disease: A New Algorithm for Pre-Flight Evaluation. Thorax. 2012. 67(11):964-969. Phillips, M., saria, M., Eisenberg, A., Kelly, D., and G. Barkhoudarian. Safety of Commercial Airflight in Patients with Brain Tumors: A Case Series. Journal of Neuro-Oncology. 2018. 139(3):617-623.